This is interesting, because it’s a matter of perspective and preparation. For those who feel apprehensive, perhaps it’s their first party with the company or perhaps they have made errors in the past, these tips are invaluable. It can be daunting socialising with staff with whom you are used to engaging on a professional basis. Remember that this is a social occasion. It’s a chance to get to know your colleagues, not grill them on Daisy’s report last week. Don’t put too much pressure on every interaction; this isn’t a second interview. Manage your intake. What starts as tipsy banter could escalate into inappropriate behaviour caused by excessive drinking. This could have serious repercussions for your job security. If you know you have a low threshold or alcohol just generally unleashes your ugly side, then maybe stick to the non-alcoholic punch. In the same vein, if you don’t usually drink or just fancy abstaining from alcohol then don’t feel pressurised to indulge. There have been cases where party gossip has been construed as discrimination against an employee. If you find yourself in a conversation that is steering towards Gossip Central, either change the subject or politely remove yourself from the situation. Tinsel scarf? Check. Santa hat? Check. Naughty elf costume? Best not. 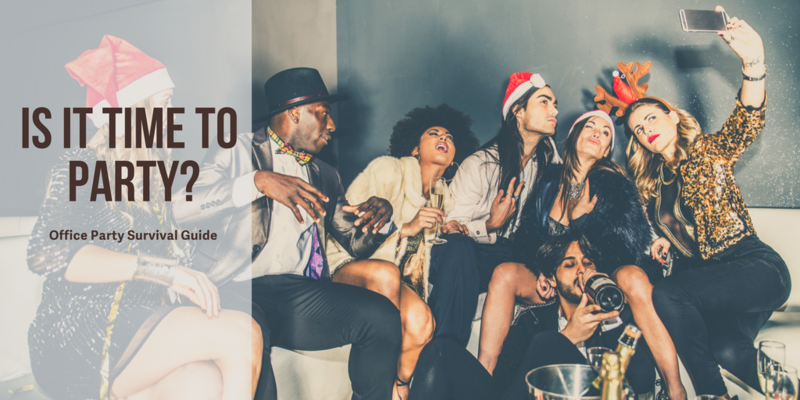 The office party is a social extension of your working environment; you want to keep your behaviour classy and your reputation intact. If the party falls on a working day then you must carry on with your work as usual and be able to face your colleagues, clients and customers. Who doesn’t like a quirky fridge magnet or a pair of flashing Rudolph socks? Joke gifts are fine but remember this ritual of present swapping will no doubt be conducted under the gaze of your colleagues and boss. Basically don’t buy anything that would make you want to remain a secret Santa after the gift exchange. No one will believe you. If it means you eat or drink less at the party or leave early, so be it. Take care of yourself so that you are bright-eyed and bushy-tailed for work the next morning.